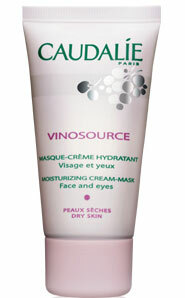 Your Best Skin: CAUDALIE Vinosource Moisturizing Cream Mask. I am having the best time trying out so many new masks this winter, and my skin is saying than you. As my skin seems to be drier than ever, moisturizing masks are what I gravitate toward, and this week I tested CAUDALIE's Vinosource Moisturizing Cream Mask. Vinosource is more like a facial in a tube! The thick mask feels extremely soothing as it is applied and my skin immediately feels hydrated, not clogged or congested as many thick masks make me feel. The ingredient list is full of skin nourishing, hydrating and protecting wonders: CAUDALIE exclusive stabilized grape-seed polyphenols Vinolevure®, Grape-seed oil, sodium hyaluronate and glycerine, cornflower, essential oils of sweet lime, lemon, orange, hybrid lavender, coriander, vetiver, wild guaiac wood and sandalwood. No wonder my skin feels so great after using. The mask instructions suggest leaving it on for 15 minutes, but like I said it is more like a facial in a tube. I tend to leave it on for a full thirty minutes to truly reap in as much moisture as I can. Even more special, this mask is so soothing and gentle, it is safe and effective on the delicate eye area. I apply a thin layer all around my eyes and eyelids as well as the mask making my mask facial complete. Vinosource is available online at caudalie.com as well as fine department stores for $40.00.